Following the August 21 attack on Eastern Ghouta, which the US and a number of other states say were carried out by the Syrian regime using nerve agents, skeptical observers have questioned the absence of a discernible motive for the regime to commit such a brazen violation of Obama’s stated “red line,” right under the nose of UN chemical weapons inspectors. After all, they say, there was no military necessity to employ such weapons given the regime’s advances in recent months using conventional weaponry and amid the likelihood of provoking a response from the US. By any measure, it appeared a reckless move and colossal miscalculation. Syrian regime allies on the other hand deny the regime’s responsibility on grounds that it would have been “utter nonsense” for government troops to use such tactics in a war it was already winning, to borrow a phrase from Vladimir Putin. Were rebels threatening the regime in Damascus? Some commentators and opposition supporters have countered that the Syrian government was, in reality, on the defensive against opposition forces in recent weeks, and that rebels have been making steady gains since late July from Eastern Ghouta – where the chemicals were then unleashed – toward the capital’s center. In the weeks since the August 21 attack, additional sources – notably, the declassified French intelligence assessment and a September 2 article by Christoph Reuter and Holger Stark published on Spiegel Online – have argued that the opposition forces’ advances in the area inspired the regime to employ chemical weapons on a massive scale. For its part, the Spiegel article relies heavily on character assessments of leading regime figures such as Maher al-Assad, Bashar’s brother who heads the army’s 4th division, and upon the purported declining morale of regime forces. It also cites regime attempts at advancing into rebel-held areas in Eastern Ghouta after the chemical weapons attack, as well as rebel victories in other provinces – in the north around Aleppo, in Deir Ezzor in the far east and in Daraa in the south. But the article offers no substantiation for rebel advances from Eastern Ghouta toward the capital prior to August 21, which is the key claim we seek to investigate. In Damascus, opposition forces have mounted a major offensive, entering many government-held areas and gaining new ground. Although the government has gone on the counter-offensive, opposition forces have been able to maintain their advance and prevented government forces from storming a number of critical areas in the city. These gains reveal the extent to which the opposition is able to adapt to changes in the operating environment, and prove that the Syrian government lacks the capacity to conclusively defeat the insurgency despite increased assistance from external allies. Few would argue with the latter claim: the Syrian government is unlikely to conclusively defeat the insurgency. But what about the major offensive by opposition forces that motivated the regime’s use of chemical weapons? Did that actually happen? Exit Left parsed O’Bagy’s analysis for clues. 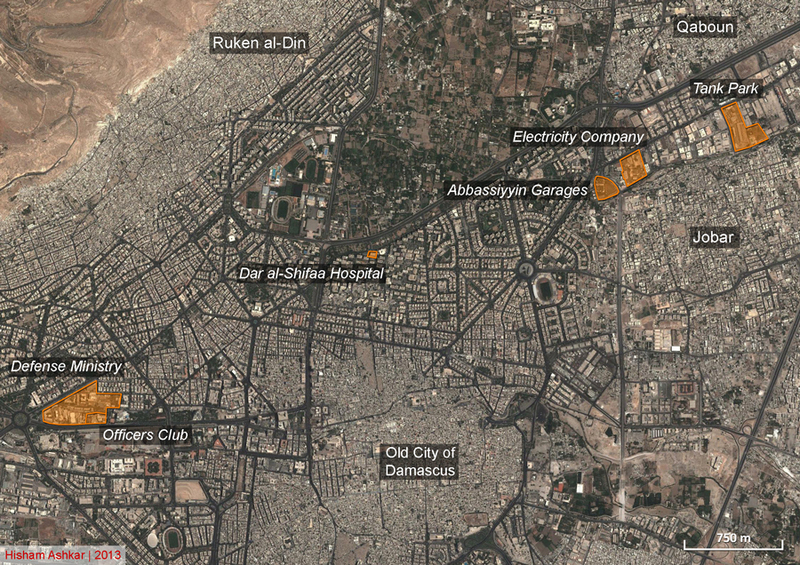 Beginning on July 24, rebel forces launched a major offensive in Damascus city. Despite the Syrian government’s continuous bombardment of Jobar, Barzeh, and Qaboun, rebels managed to push into the Jobar neighborhood, and from there began a concerted drive into government-held districts in the city. To substantiate this claim, O’Bagy links to a video uploaded by D.C. Pulsation, which describes the hardship and dwindling medical supplies suffered in Qaboun under shelling from regime forces. But the video narration makes no mention of a rebel advance. Rather than a “concerted drive,” the narrator states that Qaboun is under siege from the Syrian army (a detail O’Bagy omits from her entire piece) and that the FSA has succeeded in repelling continuous attacks. The date of July 24 advanced by O’Bagy for the major offensive coincides with the date of a rebel counterattack on the industrial area in Qaboun. After major clashes between government and rebel forces, the opposition took control of the Abbassiyeen garages, an important government-controlled facility. One of the “gateways to Damascus,” the bus station on the road linking Homs to the capital has been the site of skirmishes between regime and rebel forces since February 2013. According to Mohammed Salaheddine, a Zamalka-based spokesperson for Syria Press frequently cited by Al-Jazeera and other media in regard to opposition military operations, rebels twice managed to hold Abbassiyyin for a few hours earlier this year, but not in the last month (as O’Bagy claims). O’Bagy references her claim with a link to a 20-second clip showing smoke arising from behind metal coils; gunfire is heard in the background, as an off-camera narrator states that the clip depicts the electricity company across from the Garages. He does not state that the opposition seized control of the Garages, but rather denies that the regime controls the electricity company facing Abbassiyyin. None of the reports issued during this period by the FSA in Damascus and its countryside (FSA-Dam), nor the Syrian Observatory for Human Rights, mention a rebel takeover of Abbassiyyin Garages, which would have been significant, though there are reports of ongoing clashes in the vicinity (from July 24, July 25, July 26, August 2 and August 6). These two claims need to be addressed separately as the area just south of Ruken al-Din lies some 2 kilometers from southern Qaboun. Regarding the electrical facility, no reference is cited for this claim and none of the FSA-Dam reports mentioned such exploits. We were unable to locate any major electrical facility in the area (and welcome any insight into this). It is worth noting that continuing a push from Jobar and reaching south of Ruken al-Din would entail more than a 2 km advance – an achievement that would likely not go unnoticed in the battle for the capital. The only notable incident just south of Ruken al-Din, that we could find around this time included mortar shelling that landed next to the Dar al-Shifaa Hospital, on July 22. Rami Abdulrahman, the director of the UK-based opposition outlet the Syrian Observatory for Human Rights, refutes that any major military operations south of Ruken al-Din took place during this period. He told Exit Left that news media depict any mortar shelling as a major turn in events, when in fact it has a negligible impact on the military situation on the ground. O’Bagy’s implication that rebels pushed from Eastern Ghouta across Damascus to the west appear unsubstantiated. Rather the shelling around Dar al-Shifaa is likely to have been part of sporadic hit-and-run attacks staged from the immediate vicinity. Indeed, random shelling and explosions across Damascus have been a frequent occurrence during the past months, and are considered part of everyday life in the Syrian capital. Map depicting the places O’Bagy mentions in regards to the rebels’ advance (with the addition of Dar al-Shifaa and the old city, mentioned in our text). The tank park O’Bagy mentions is located in the industrial zone in Qaboun (next to Abbassiyyin Garages), an area that the regime seized back from rebels in early July 2013. A couple weeks later, on July 24, rebels launched a counterattack with the objective of relieving the besieged Barzeh and Qaboun. The rebels entered the electricity company on the first day, and managed to take control of several buildings in those that followed. 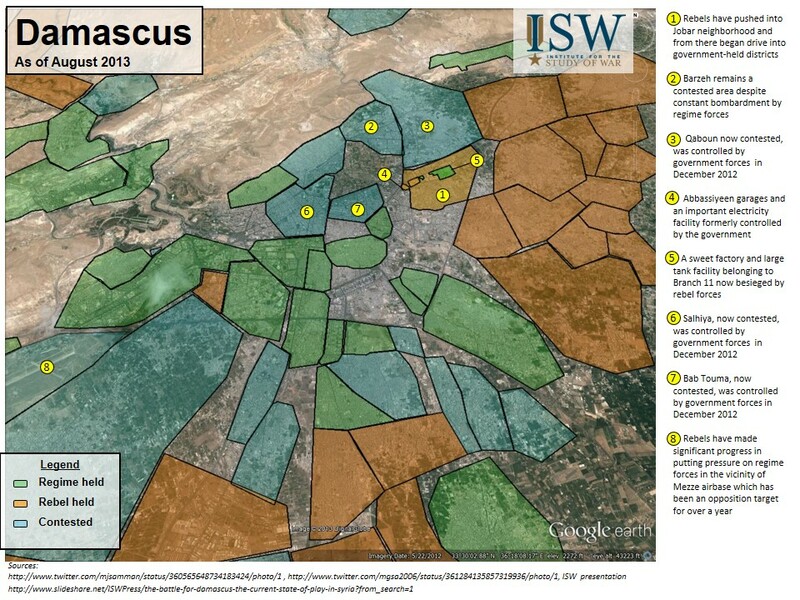 A map published published on August 3 by LCC Jobar depicts the supposed gains by rebels and areas under regime fire. It suggests that the regime holds the northern part (Crush factory area on the map) and shows an overlap in regime and opposition positions. The rebel’s advance is neither major nor stable, and according to Salaheddine, control of areas of the factory continues to switch back and forth. As for the electricity company, Abdulrahman says that it remains under regime sniper fire control, and that the rebels have seized positions adjacent to it. Rebel advances in the industrial zone in Jobar, according to a map posted by LCC Jobar on 3 August 2013.
the opposition has moved into government-held territory previously thought to be impenetrable. While the overall operational value of such victories may be limited, the area has a large military presence and is symbolically important as it nears the Defense Ministry and the Officer’s Club. The Defense Ministry, however, is 2 km to the south of Ruken al-Din, and around 4.5 km from Abbassiyyin Garages. In the context of the urban warfare being waged around Syria’s capital, from building to building, this likely represents a safe distance from the combat zone. In order to better organize and coordinate operations in Jobar, Qaboun, and Barzeh, a number of rebel groups have recently banded together to create Jabhat Fatah al-‘Asima, or the Front to Open the Capital. The new front reportedly comprises 23 different battalions, most notably of which includes the Farouq al-Sham Battalion and the Habib Moustafa Brigade. Previously, units in these areas have tended to remain small, having to operate underground and in secrecy to avoid regime detection. However, emboldened by recent successes, more and more rebel groups have shown a willingness to coalesce into larger alliances with the hopes of bringing greater forces to bear and coordinating more effectively on operations. Jabhat Fath al-Assima announced their creation on July 26. However their manifesto video states that this entails unification of rebel military formations in Jobar alone. Salaheddine also asserts that this formation is confined to Jobar. In a statement released by Ahrar al-Sham in early August, the group claims to be at the “doors of Damascus, advancing from eastern Ghouta and southern Damascus.”  While such declarations evidence more bravado than reality, there is some truth to the statement that the opposition is advancing on Damascus in ways previously unseen. Contrary to what O’Bagy suggests, the rebels don’t claim to be “at the doors of Damascus, advancing…” It is neither a present take nor a future threat, but in the past tense – an apparent reference to a stage earlier in the conflict when rebels were united and succeeded in reaching Damascus’ gates, so as to to urge splinter groups to reunify. Jund al-Malahem’s Facebook page shows that their military operations are concentrated in the east of Eastern Ghouta – away from the capital – around Deir Selman, Ahmadiya and Marj al-Sultan (for location see map below). Both Abdulrahman and Salaheddine assert that during the past month or two, there was no major change in the military situation in and around Jobar toward Damascus. They also declare that there was no indication suggesting preparation for a major push towards the capital. O’Bagy not only in some cases exaggerates, misrepresents, and alters information to bolster claims which are not substantiated. Curiously, she also does not once mention the crushing siege Eastern Ghouta has been subjected to by regime forces since the end of April 2013, to which hundreds of videos, reports and statements attest. Juxtaposing O’Bagy’s claims against those made by rebel forces, who have a demonstrated inclination to exaggerate their military achievements, further underlines the spuriousness of her case. One of the hotbeds of the uprising since April 2011, Eastern Ghouta was the site of the first FSA operations. November 2012 saw the beginning of a major FSA offensive in Eastern Ghouta targeting regime positions, most of which were located outside of the towns. Damascus International Airport became one of the main targets for opposition forces. Although for a brief period rebels managed to disrupt air traffic and seize portions of the airport highway, they were rebuffed following a major offensive by regime forces on 1 December 2012. By February 2013, the rebels controlled nearly all of Eastern Ghouta, and were consolidating their positions in Jobar in the west, and in Adra to the east, with renewed attacks on Damascus Airport. Early in April 2013, as fighting raged in Jobar, Abbassiyyin and Qaboun – some 500 meters from the old city in Damascus – the Syrian regime launched an offensive from the east, from its bases in Damascus Airport and ad-Dumayr in an attempt to encircle Eastern Ghouta. This maneuver resulted in the fall of Otayba to regime forces on April 24, thus encircling Eastern Ghouta. Regime forces continued their slow advance into rebel-held areas, occupying al-Qisa on May 2, Harran al-Awamid by May 29, and Khamassiya on August 18. In the west, battles raged around Abbassiyyin garages, and the industrial area in Qaboun. In our assessment, the military situation in Eastern Ghouta in the weeks leading up to the chemical weapons attack did not constitute a substantive advance by opposition forces toward Damascus. The only attempts to break the siege were conducted by the besieged rebels themselves – no such attempts were made from fighters outside. Furthermore, Eastern Ghouta rebels were losing some of their fighters who were withdrawing to the Qalamoun area north of Damascus. However, the precarious condition of the besieged rebels does not mean that the regime was “winning.” It had made some gains by encircling Eastern Ghouta and occupying a few localities to the east. Nevertheless, its attempts at advancement in the west had been successfully repelled by the rebels. It is fair to say that a stalemate situation existed in Eastern Ghouta with a slight advantage for the regime. While it is possible that the regime employed chemical weapons in Eastern Ghouta ahead of its own intended offensive, it does not appear to have been motivated by the opposition’s advances, as French intelligence and Spiegel claim. While we can’t ascertain whether chemical weapons were employed out of frustration, our research and even the US intelligence reports indicate that the attacks were not utilized due to perceived military necessity, which is further substantiated by the fact that the targets in the CW attack – and resulting casualties – appeared not to have been military positions. US Republican Congressman Mike Rogers has suggested that the weapons may have been employed to achieve a “tactical denial of battle space.” However, given the apparent lack of urgency due to an effective stalemate on this front, the timing (coinciding with the arrival of UN inspectors) is nevertheless inexplicable. Neither explanation appears to explain why chemical weapons were used on 21 August. The motives, reasons and perceived objectives for using chemical weapons likely lie elsewhere, outside the limited scope of the military context. One concrete reference that would appear to shed light onto the motive behind the strikes involves alleged phone calls intercepted by Israel and the United States that purportedly showed Syrian defense officials were panicked and demanding answers after the chemical attack. This evidence ought to be presented to the public. If rogue or specific elements within the regime are ordering the use of chemical weapons, or if the chain of command has broken down, surely this should inform the discussion and proposed actions. On the highway separating Zamalka from Jobar and Qaboun (al-Moutahalliq al-Janoubi), the regime holds a pivotal point at Tohme Checkpoint, a bit north of the pedestrian bridge between Zamalka and Qaboun. To the south of the bridge, the highway is controlled by rebels. However, it remains under relentless regime fire, which has led rebels to use the highway’s under-passage to cross into Jobar. In Jobar, the front line stretches from Zablatani in the south to the Afran (bakeries). In Qaboun, the regime control the western part around the municipality, towards the Abbassiyyin Garages, and in Barzeh, the rebels control Barzeh al-Balad, while the regime holds al-Masaken. As for Zamalka, it is under complete control by opposition forces. In the last 6 months, it sustained four regime attacks that were successfully repelled, the last one a month ago prior to the chemical weapons attack on August 21. 1. ↑ A self-described “non-partisan, non-profit, public policy research organization” headed by Kimberly Kagan, ISW’s funders include weapons manufacturers such as Raytheon and military contractors such as Dyncorps and CACI International. 2. ↑ D.C.Pulsation is a network of citizen journalists covering news in Damascus and its countryside. 3. ↑ Exit Left spoke to Salaheddine via Skype on 4 September 2013. No subsequent mention is made in al-Samman’s twitter feed of this major battle, and there were no reports of such a battle on rebel pages or in the media. The only notable incident in the vicinity of the Political Security buildings around this time included mortar shelling that landed next to the Dar al-Shifaa Hospital, on July 22. 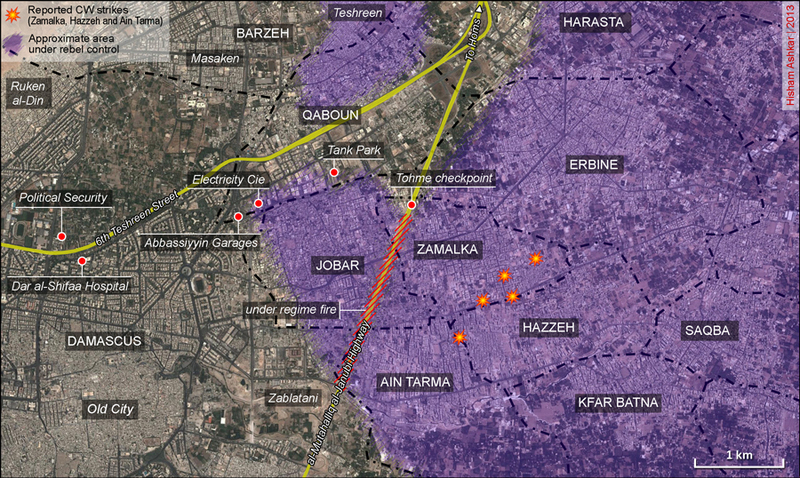 The other two sources for the map are a link to an old slideshow by ISW from December 2012 and another Twitter link to a map that depicts the industrial area in Qaboun. 5. ↑ Exit Left spoke to Abdulrahman by phone on 5 September 2013. 6. ↑ In the southern part of the map, the area under regime sniper fire consists of roads only, which suggests that other places to the south are shielded by buildings in front of them, which in turn leads to the conclusion that regime forces controls the Crush factory area. 7. ↑ This is the same electricity company depicted in the video that O’Bagy altered the title for to claim Abbassiyyin Garages were taken over by opposition forces. 8. ↑ Unfortunately, O’Bagy does not provide links to any of the footnotes numbered 4 -14 and 18-27. 9. ↑ According to Jabhat Fath al-Assima’s Facebook page, all their military operations are taking place in Jobar. 10. ↑ Furthermore, regarding Ahrar al Sham, O’Bagy later cites a video titled “Ahrar al-Sham uses missiles to destroy regime forces” in her endnotes. The accompanying link, however, leads to the same 20-second clip from the electricity factory (which she had earlier cited and re-titled as depicting the takeover of Abbassiyyin Garages.) These could well be editing mistakes. 11. ↑ The tweets in question are: a – b – c – d – e – f – g – h – i – j – k – l – m – n – o. 12. ↑ According to his Twitter account, Khoubeib al-Sham is Jund al-Malahem’s “external communication” delegate. 13. ↑ To name a few: A broadcast station in Saqba on November 13; the transport regiment in Shifouniya, south of Duma, on November 15; a brigade command center in Hatite on November 19; the PFLP-GC barracks in Rayhan, east of Duma, on November 25; Marj al-Sultan airport on November 26, and so on.